← Learning to shut-up and listen. I remember the first time I went to Thailand, back in 2003, I was chatting with a Thai man, and when I said I was from Australia the first thing he said to me was ‘ all I know about Australia is that you have lots of rules there – you have to wear closed shoes in bars, no-one is allowed to sell food on the street, and only two people can be on a motorbike at once‘. Nothing about the normal kangaroos, sharks or loud drunk backpackers, but that we lived in a country where there were lots of rules and more or less we actually obeyed them. Currently living in Mexico City for the past year and having just returned from a brief visit to Australia – I was reminded of this conversation with my Thai friend over a decade ago about Australia being a nanny state. 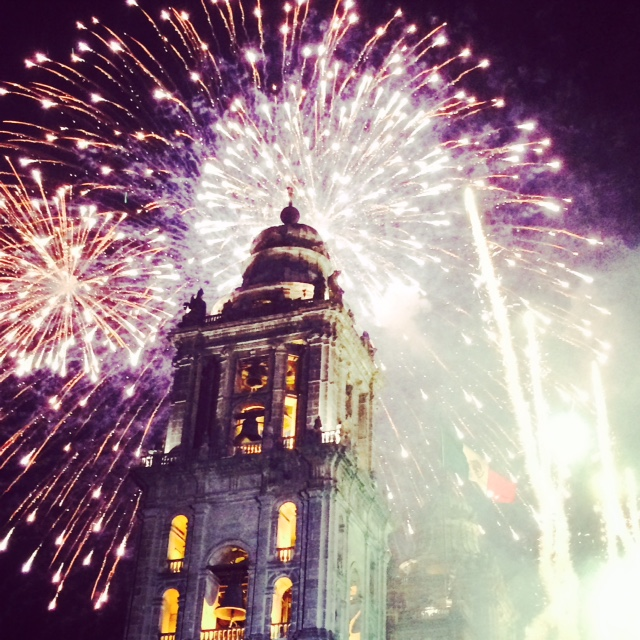 A couple of weeks ago was Mexican Independence Day and to celebrate there were street festivities and fire works. The festivities culminated at midnight with the president ringing a bell from the balcony of the palace to the crowd of 100,000 people below yelling ‘Viva Mexico’. During the evening as we were making our way to the centre of the city for the final celebration, we were cruising on bikes up the main avenue. This was closed to traffic and so just pedestrians, cyclists and street vendors selling Mexican paraphernalia filled the divided 6 lane road. Police manned the cross-road corners with their automatic rifles, as they chatted on their phones and ate ice-creams. As we cruised passed them, they waved us on to continue down the main drag as they started to let fireworks off. I have never been so close to fireworks. It was loud and exciting. We were smiling giddily to each other as we blew our Mexican plastic horns we had just bought from a sweet old lady. And then I felt things hitting my head… first little black pieces, then bigger bits that looked (and felt) like rubber coconut shells. It was shrapnel from the fireworks. There were kids running around and happily picking the bits up with their parents watching on. I pulled my scarf over my head and face, looked down, and added a little more peddle power. I also thought, why wasn’t it fenced off? Why did the police man wave us on? What if someone got injured? They shouldn’t be letting people go through. Surely there is a rule against this?! If I get hurt, who’s fault is it? But no – this is Mexico – no rule, just self responsibility and decisions about how close you want to go before you get burnt. Or hit on the head with shrapnel. This morning I was again reminded of this lack of rules, or alternatively the appreciation for self-responsibility, that exists in Mexico. There was an archery competition set up down the middle of a main street. It had drawn a big crowd and was an official competition, with people in uniform, film cameras, big screens and seating for the spectators. The seating went right along the shooting line, down the sides of the street, to the target. So that some people were standing and sitting about 2 meters from the target itself. No screens, protective barriers, or room for error. Just lots of trust in the shooter and the decision to sit in high risk seats. Again, my solid Australian upbringing kicked in and my first thoughts jumped to rules, protection, safety. But no – none of that here. Just each to their own. Good old, self-responsibility. While I am worrying about my safety, lack of rules and who’s fault it is when something goes wrong, my Mexican compatriots are just enjoying the moment. Content that the joy of collecting firework shrapnel or watching an archery fly past your nose far outweighs the risk. Self-responsibility plays a bigger role than formal rules and regulations. In Mexico City I often feel like I am peeling away the layers of structure and compliance that have been built up over the years. I am re-learning how to make choices in a chaotic society that is not founded on rules and structure. Whether that be what type of shoes I wear into a bar, or if I should eat the street tacos on a second-hand plate made with no gloves. Or should I change lanes without an indicator like everyone else or ride my bike directly under falling firework shrapnel. When you live in a country like Australia, there is a regulation for every one of these instances so there would be no decision to make. Rules and self-responsibility are inverse. So the more rules we have, the less we rely on ourselves to make decisions and take responsibility for our actions. We look to blame someone because we should have been protected from the danger and informed there was a cliff ahead, or a man hole cover missing, or an archery competition on. Living outside the structure, I am learning to make decisions again. So far it is going well, and I am actually ok at trusting my instinct when there are no rules to tell me what to do. In a society founded on self-responsibility, it does mean that if, or when, something goes wrong there is no-one to blame. Except of course yourself. Who really is the one that should be responsible for all the decisions you make anyway. Just imagine a world where people were not responsible for their actions… or lets not. Instead let’s just focus on bringing back self-responsibility. I agree Sar – good blog. Sary. To a degree, I think you can probably trace this back to the common law versus civil law system. (i.e. duty of care and getting sued for failing to take care is pretty important in the common law system). Great post Sarah! I’ve had the exact same experience in Amsterdam, which, while no where near as chaotic as Mexico, seems to be has the same believe in self responsibility. Even when there are laws, the mentality is more focused on you as an individual deciding whether its something you should ethically follow or not. The consequences are your responsibility. And it doesn’t lead to anarchary, but instead to a thoughtful society and responsible mentality in many ways. Thanks for sharing!